will be the first one to implement the idea of "bus bucks." Bravo to John Turmel for initiating this idea!! I'm spreading the word about Bus Bucks. opportunity to earn instead of them just being given things. bus. Good luck on your campaign. how to create jobs and get people using the transit system. I've always been a supporter of alternate currency. BUT I THINK THERE IS SOME KIND OF GOVT PROBLEMS????? Unions?? Jct: What a great idea to let pan handlers earn Bus Bucks too. her and she and I will get our London friends to support you. housing projects - I hate politics but only way to be heard. to help these young people and teach them how to work. helped me too in those terrible GST times. recklessly with total NO COMMON SENSE. spending $Millions of taxpayers money. and other social assistances just cant seem to catch a break. is no help with it. Bucks for a spare room. travel the world on the Bus Bucks UNILETS TimeBank Accounts. rates. Thank you for the information." You're the first of over 350 who has responded positively. More power to you, Karen Appleton. the consumer's preferred monetary system. can bank the cash and save the interest. we've substituted for with Bus Bucks and keep the interest. causes with regards to savings." JCT: Can't resist including those candidates who cannot see. about Bus Bucks and caught on. On October 18, 2010, with her husband Rod holding her hand, Joan answered her Master's call and slipped quietly away to be with her Lord and Savior after a courageous three year battle with breast cancer. She was 61 years old. Joan's remarkable life began in Racine WI on May 17, 1949, born as a twin with Raymond, to Albert A. and Mary A. (Parino) Yocco. On March 22, 1963 Joan asked Jesus to come into her heart and be her Lord and Savior, after which she dedicated her life to doing God's will. Joan is a graduate of Horlick High School, class of '67, continued on to attend Moody Bible Institute in Chicago, then finished her education at Geneva College in Beaver Falls PA earning her Bachelor's degree in Business. Joan's career began as an executive secretary in the International Department at J I Case Company. Upon earning her business degree she worked as a Certified Financial Planner in PA, The IDS and Windsor Financial Group in MD, before incorporating and opening Veon Financial Services, Inc. in the spring of 1986. 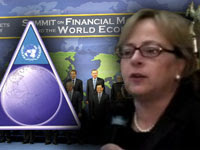 As Joan studied financial trends she began to notice an alignment indicating a world currency. Joan prayed diligently for God to show her truth and in 1994 the Lord opened the door for her to attend her first global meeting on Population Control in Cairo Egypt, initiating her first glimpse of world government. Thus beginning Joan's second career as a credentialed, independent, International Journalist reporting for USA Radio News Network. During the next 16 years the Lord opened doors for Joan to interview and ask key questions of prime ministers, presidents, kings, and heads of state. At times, as the only American reporter, Joan covered over 103 international meetings, including: the G7, G8, G10, G20, and Bank for International Settlements (BIS) in Basel Switzerland; attended yearly the World Economic Forum in Davos Switzerland; and twice a year covered the IMF World Bank meetings. Though small in stature, Joan was a giant warrior and devout patriot. Visitation will be held on Sunday, October 24, 2010 from 4 p.m. to 6 p.m. at Purath-Strand Funeral Home, Douglas Av at 3 Mile Rd. in Racine, WI. Services to be held on Monday, October 25, 2010, at 11 a.m., at Calvary Memorial Church, 4001 Washington Avenue in Racine, WI, interment to follow at West Lawn Cemetery. Donations in Joan's honor can be made to the Women's International Media Group, Inc., PO Box 77, Middletown MD 21769. 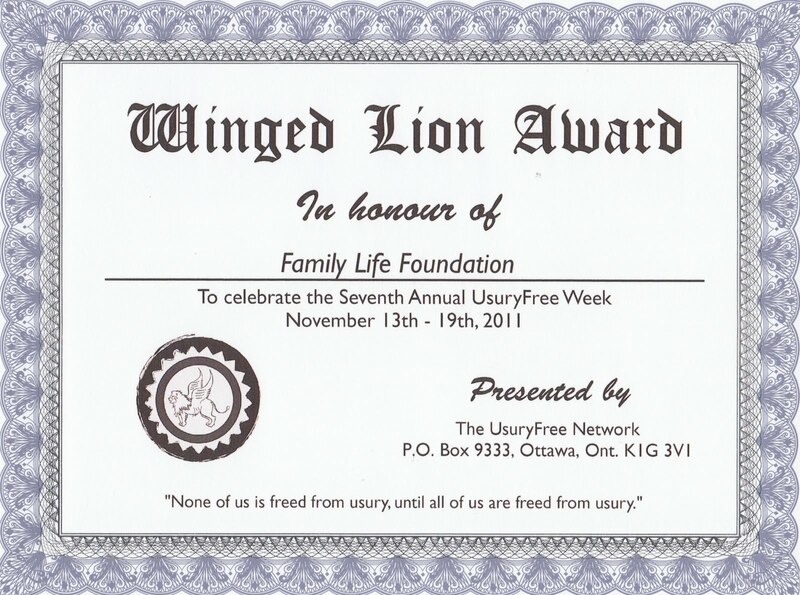 The Winged Lion Awards are in honour of the ‘Winged Lion’ – which is the historical symbol of usuryfree money. The Winged Lion Awards are presented to the winners from the nominated usuryfree creatives on behalf of the UsuryFree Network during the Annual UsuryFree Week scheduled from November 13th, until November 19th, each year. 14. A member of the clergy (from any denomination) who is actively speaking outagainst the design flaw of usury and its eveil effects on individuals and on society. Proof of his/her usuryfree mission must be submitted with the nomination. NOTE: Readers are invited to suggest additional categories that could be considered for a nomination for a Winged Lion Award. Send your suggestion to the The UsuryFree Network at the address below. All nominations for the Winged Lion Awards must be postmarked on or before November 1st, of the current year. Let's say you want to buy a house and go the bank and get a loan. Say 200k. The simple truth is, after thirty years you will have payed back 600k. 200k for the principal and 400k (!!) in interest. Now this might be ok, or at least somewhat understandable, if you were borrowing this money from somebody else, who has been saving it. But as we know, this is not the case. The money is produced the moment the loan is granted by the bank. In a computer program. By pressing a few buttons. So basically you pay 400k interest for pressing a button. Granted, the bank needs to manage the loan during the time it is being repaid. But the cost for this is still only a fraction of the income they get through the interest. Now, we could stop here, because it is clear that the bank is ripping us off, also in legal terms, although they make the laws themselves, because there is no realistic service being delivered for the money. But there is so much more, we must continue. When the bank creates some money by giving you a loan, it takes the money out of circulation when you repay. Repaying debts means a diminishing money supply. The banks only provide the principal, in our previous example 200k. But after thirty years, 600k has been repaid and only 200k was created. So how can this be? How can 600k be repaid by 200k? It can't. Somebody else needs to get into debt to create sufficient liquidity to pay the 400k interest. And the borrower of the original loan must start competing for this liquidity with everybody else to obtain that, intrinsically scarce, cash. This means that because of the combination of debt and interest, the money supply must grow forever. But we know that a growing money supply is the definition of inflation and that inflation is closely linked to rising prices. So inflation is inherent in the system. This sounds strange, because Central Banks raise interest rates to lower inflation, reasoning less credit will be issued because of rising prices for it. But the higher the interest rates go, the more money must be created to pay for this interest. Just one of the perverse side effects of interest in the current wealth transfer system we call 'finance'. So what of it you think. I was raised to be conservative in these matters and one should simply not get into debt, so you won't pay interest. Wrong. Not only because if nobody went into debt, there would be no money, but because companies go into debt to finance their production. They pay interest (capital costs) over these loans. And like any cost this must be calculated into the prices they ask for their goods and services. And what percentage of prices can be related to interest? It depends on the kind of business, particularly how capital intensive it is. Going from 12% for garbage collection to 77% for renting a house. All in all about 40% of prices can be traced back to costs for capital. These figures have been corroborated by an independent study done by Erasmus University, Rotterdam, the Netherlands under the supervision of STRO, a leading monetary think tank in the Netherlands. So, you lose 40% (!!!!) of your disposable income to interest through prices. Interest is being paid by people borrowing money and received by people having loads of it. So it is per definition a wealth transfer from poor to rich. It transpires, that about 80% of the poorest people pay more interest than they receive to the richest 10%. The next richest 10% pay as much as they receive. This means the vast majority is losing a substantial part of their money to interest. The richest own the banks or have a lot of money there. We must keep in mind that this is totally for nothing, since most of the money is printed at the time it is loaned out. How much money are we talking about? I have only figures for Germany, but reason suggests it is basically the same everywhere. In Germany the poorest 80% pay 1 billion Euros in interest to the richest 10% PER DAY. Yes, that's right, one billion euros per day. That is a grand total of 365 billion euro's per year. That is one seventh of German GDP and extrapolating this to America, the poorest 80% must be paying at least a trillion a year. It conclusively explains the old adage that the rich get richer and the poor get poorer. This is the hidden tax that nobody is talking about. This is the yoke that we carry. This is the worst kind of slavery, because it is slavery without even realizing it. This is interest and let it never be forgotten. This is our mortal enemy and let us never take our eyes of it again, until it is thrown into the fire of hell, together with the usurers enslaving us with it. These are the letters that were sent to Home Depot re: usury resistance by informed usuryfree creatives. To read the background details of what happened before these letters were written to Home Depot click here. Hopefully, I will not have to go further up the heirarchal chain of the “Big Orange” to (a) using the “Ben Hill” toll free telephone number (1.800.668.2266) and/or (b) contacting Annette Verschuren, President, Home Depot Canada to get satisfaction for this complaint. If your Home Depot store in co-operation with Home Depot Canada Corporation do not immediately waive the outstanding interest (usury) fees of $440.25 on my Home Depot Credit Card account I will be contacting Grasshopper Media with a request to come to the parking lot of your Home Depot Store to interview customers (coming and going) about their unique and costly experiences with the “No Payments, No Interest & No Fees for 6 Months” Home Depot Credit Card. Then Grasshopper Media will post these interviews on such social networking websites as YouTube, Facebook, My Space. Twitter etc. so that the Court of Public Review will be informed about how the “Big Orange” gets bigger financially by fleecing its customers with deceitful and greedy interest (usury) charges that are levied on the “No Payments, No Interest & No Fees for 6 Months” Home Depot Credit Card when the customer is one day late with a monthly payment. And, as a follow up I will do my part to initiate “bad-word-of-mouth” advertising so that more consumers will be better informed about Home Depot’s unbending adherence to greedy policies and rules intent on ‘theft by usury.” Indeed, unless the $440.25 of interest (usury) is waived from my Home Depot Credit Card account, this will be a hot topic over many drinks at barbecues with families, friends and neighbours this summer and I will never spend another cent at any Home Depot store - and I will invite others to likewise avoid shopping at any Home Depot store so that the financial reverses that the Home Depot corporation has been suffering in recent months continues into the future. Blogger, Tom J. Kenendy has summarized the details of my recent complaint about Home Depot’s ‘fine print’ policy to fleece unsuspecting consumers with exhorbitant rates of interest (which ought to be correctly called usury) when they are one day late with a monthly payment. This summary is attached as a separate document with this letter. My Home Depot credit card account is now paid in full - for the merchandise that I have purchased. The remaining balance of $440.25 is the amount of interest (usury) that I am requesting Home Depot Credit Services to waive so that my account balance is reduced to zero. 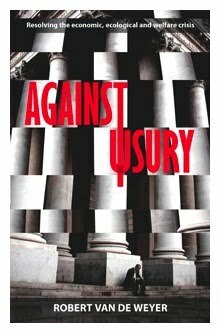 PS: For your own personal library I have included a copy of Tom J. Kennedy’s booklet “Life Without Usury” - a collection of historical and current articles about the design flaw of usury and its effects on debtors at all levels - individuals, families, companies and governments. I am still waiting for your written response to my letter to you dated July 13, 2010. Enclosed is a copy of the most recent statment of my Home Depot credit card account. It still shows a charge of $220.12 (interest) which is due on August 27, 2010. Please provide a written response to our discussion and the documents that we left with you on July 6th explaining the situation - and the follow up letter of July 26th. Please provide this written response before August 27th, 2010. I have received your letter dated August 23, 2010 with the copy of the receipt for $220.12 (document 6068****) whereby you cleared up the balance of overdue interest (usury) on my Home Depot credit card account. I sincerely thank you for your confirmation in writing. As Manager of a Home Depot Store, you have demonstrated that your store is intent on promoting friendly customer service. My partner and myself will continue to choose your store when we need to purchase items for our home. And we will continue to tell our families, friends and neighbours about the high quality of service that we have received at Home Depot. What we have learned is what we will share with others - that is to read the fine print of the “No Payments, No Interest & No Fees for 6 Months” Home Depot “interest-free” credit card and never to be one day late with any monthly payment. The self-imposed mssion of this author was to find out whether or not Home Depot is a Greedy Coropration Engaged in the Immoral and Evil Action of Exacting and Collecting Exhorbitant Amounts of Usury from Unsuspecting Consumers who sign up for Home Depot’s “interest-free” credit card??? What follows is a detailed report about how a couple of usuryfree creatives won a victory by resisting to pay the exhorbitant amount of usury exacted on their “interest-free” Home Depot credit card. One suspects that too many consumers are being taken advantage of by Home Depot because they do not read the fine print on Home Depot’s “interest-free” credit card nor are they consistent when they resist paying unnecessary “usury” being exacted on their credit card account. Others are asking: "Is Home Depot credit card a scam?" 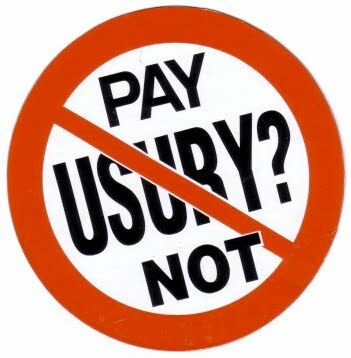 Usury, the ultimate destroyer of human potential is the greatest scam in history ever perpetrated upon an unsuspecting public. Everyone knows someone who is a victim of the evil and immoral design flaw of usury. Every year more and more farmers, fishermen, forestry workers, factory workers, miners as well as professionals are runied financially either directly or indirectly due to the evil and immoral function of usury as it is exacted within our orthodox, economic system of debt-money. Within the above-listed groups of people who are harmed financially by the exacting of usury are those countless numbers of consumers who were persuaded to complete a “Consumer Credit Card Application” for Home Depot Credit Services. By using a catchy phrase “Get Instant Credit Now” with “No Payments, No Interest & No Fees for 6 Months” many consumers were cajoled into requesting a Home Depot Credit Card. In the Summer of 2008, I learned about a couple who were preparing to embark on a major basement renovation. At that time, they were persuaded by Home Depot staff to complete a “Consumer Credit Card Application” as they were planning to spend a considerable amount of money for building materials. Some of their payments were deferred for six months, others for tweleve months and some for fourteen months. Since the most important element of a credit card is the rate of zero interest (usury) they anticipated that the Home Depot credit card would be the optimal credit card to use when we were shopping at Home Depot. However, they have learned that Home Depot’s enticing benefits are trumped by their greedy 28.8% interest (usury) fees that are exacted when any monthly payment is one day late! How deceptive and deceitful the fine print can be!! One must go back and read the fine print of the Cardholder Agreement to get the full story about the 28.8% fee of interest (usury) being exacted on the Home Depot credit card. One can only assume that thousands of unsuspecting Home Depot consumers are unknowingly trapped into the 28.8% fee of interest (usury) because they were one day late with a monthly payment on their “No Payments, No Interest & No Fees for 6 Months” Home Depot credit card. From August 2009 until June 24, 2010 they again made every monthly payment in full. On June 28th they had to go out of town on family matters and they did not return to Ottawa until the evening of July 6th, 2010. On July 7th, 2010, they went to Home Depot and paid $1306.26 which was a couple of days overdue. On Friday, July 9, 2010 they received the Account Statement from Home Depot Credit Services which had a charge of $440.25 (interest or usury) charges. They were stunned at the exhorbitant (interest or usury) fees which were added to their Account Statement for July 2010. They went to the Home Depot where they had purchased the merchandise to ask for an explanation of the exhorbitant usury fees. A cordial staff member there there telephoned the toll free number (1.800.747.3787) for Home Depot Credit Services. They waited 20 minutes on the phone to talk with a staff member named ‘Cozana’ with ID No. 4V0. His direct telephone line is: 1.519.642.9629. 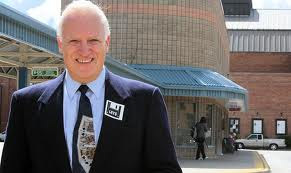 Cozana repeatedly explained that the $440.25 was the amount of ‘accrued’ usury charges that were levied on the total amount of $1613.41 for the previous fourteen month period simply because when they were out of town for part of the last week of June and the first week of July 2010. Apparently, being one day late with a payment is reason enough for Home Depot’s rigid ‘creditor’ bureaucracy to inflict severe economic pain on its credit card debtors. They explained to Cozana that they had been very good customers of Home Depot for more than two years and that they had spend a considerable amount of money on building materials and that they expected Home Depot to earn profits from selling merchandise. They added that they were absolutely opposed to paying interest or usury to Home Depot and that it was grossly unfair for such exhorbitant usury fees to be added to their bill since they had a good reason to be a couple of days late for the payments due on June 30th and July 2nd, 2010. Cozana responded with a comment indicating that Home Depot Credit Services has the intention of making money by charging usury. Then they added, that hearsay has it that many of the giant, retail, transnational corporations are making more money from charging consumers “usury” than they are by selling merchandise. At the end of the conversation they asked Cozana to waive the usury charges of $440.25. Cozana responded that Home Depot would only waive 50% of the usury charges. They then told him that they would like to talk with one of the managers at the Home Depot where they had purchased all of their building materials because they still want 100% of the usury fees waived - otherwise they will never shop at Home Depot again. Additionally, they explained that they will contact some media sources for a follow up story and of course they said that they would be encouraging all of their family, friends and neighbours as well as their many friends in cyberspace NOT to shop at any Home Depot store in the future. Before they left the Home Depot store on Friday, June 9th, they paid off the balance owing for merchandise that they purchased in the amount of $1401.22. They did not pay the $440.25 in usury fees. On Tuesday, July 13, 2010 they planned to hand deliver a letter with accompanying documents to one of the managers at the Home Depot with the hope of experiencing financial justice from the Home Depot corporation. It is critical for all consumers to become re-educated about the design flaw of usury and how it wreaks havoc on debtors. Retail corporations (including Home Depot) that own the credit cards are scamming debtors for multiple millions of dollars by exacting the ridiculous amount of 28.8% usury fees on accumulated credit card debt. Just imagine the amout of usury being exacted each month on the unpaid credit card balances of consumers. It is both immoral and criminal!! Readers are invited to spend some time reading the articles posted at the blog titled “The UsuryFree Eye Opener” to fully understand why the design flaw of usury must be exposed for the evil, immoral and killer machine that it really is. To read the letters sent to Home Depot re: usury resistance by these informed usuryfree creatives click here. In economic and political matters Christians often find themselves adopting the views of secular thinkers and campaigners, usually left-of-centre in their bias. Yet prior to the seventeenth century Christians had their own distinct economic outlook, arising from the Bible: that usury is the fundamental cause of economic crises and injustices, and that its prohibition, or at least reduction, is the only means to sustainable prosperity for all. Islam, which continues to prohibit usury, adopted its antipathy from Christianity. Sadly, owing in part to a misunderstanding of the nature of usury by the great reformer John Calvin, amongst others, the Christian churches lifted their prohibition; and many devout Christians became ardent usurers, accumulating great fortunes in the process. 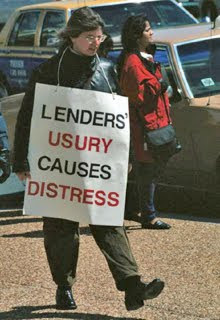 However, usury lies at the heart not only of the current economic and financial crisis, but also of two other much deeper and longer-term crises: the degradation of our natural environment, with the acute danger of disastrous climate change; and our failure to devote sufficient resources to social welfare, especially education and healthcare. Usury is often defined as the charging of interest on loans; and it is this that the Bible specifically outlaws. Scholars in medieval times reflected on what was wrong with charging interest, and they concluded that it was the unequal sharing of risk; indeed, the Fifth Lateran Council in 1512 adopted this as its definition. We may seek to eliminate risk by quantifying it and then spreading it, such as through insurance. But, as the medieval writers understood clearly, this assumes that the past is a reliable guide to the future, which it is not. It also assumes that there are no hidden factors linking apparently disparate risks – the problem of ‘systemic risk’, in modern jargon. In fact, to our Christian forbears human efforts to quantify and spread risk would have seemed like idolatry, since God alone can know the future. The medieval scholars thus argued that usury is intrinsically unjust. It is obvious that a transaction is unjust when one party benefits far more than others, such as when the seller exploits monopoly power. Similarly it is unjust when one party carries far more risk than others – although, since risks may be ‘upside’ as well as ‘downside’, it is impossible to know in advance who will win or lose. There are three main forms of usury in modern society, which are the causes respectively of our economic recession, the chronic under-funding of welfare services, and the long-term ecological crisis. Modern banking is founded on usury in the primary sense of charging interest: banks take deposits from the public, and then lend that money at interest to individuals and businesses. In normal times the borrowers carry the risk, since, regardless of changes in their financial circumstances, they must still pay the interest and repay the loan itself. At the same time the banks promise depositors – who in effect are lenders – that they can withdraw their loans on demand; and this has enabled bank deposits to become the main form of money. But in abnormal times – such as occurred in 2008 – when large numbers of borrowers start to default, the banks are unable to honour their promise to depositors, thereby threatening the entire economic system. Governments thus have no choice but to guarantee the deposits with taxpayers’ money – so the risk is transferred in its entirety to the public. The implicit knowledge of this taxpayers’ guarantee has encouraged banks to lend recklessly at high interest, enabling bankers to pay themselves large bonuses. The usurious nature of banking has, however, had a much deeper and more damaging effect on the global economy than provoking a brief financial meltdown. By provided a safe place for people to keep their money, banking encourages very high levels of saving, especially in Asia. During the long boom prior to 2008 people in the West were willing to borrow those savings to fuel a housing bubble and excess consumption. But now Asian savings remain very high, while western savings return to normal levels. As a result there is chronic lack of demand in the global economy. Governments are currently disguising this by huge levels of public borrowing and spending. But this cannot continue; and sooner or later the global economy will find itself mired in a chronic recession, with high levels of unemployment – just as the great economist Keynes predicted. The second main form of usury is taxation. Most western governments now take over 40% of people’s income in various forms of taxation. But a major effect of high taxation is to skew the risks taken by those starting and expanding businesses, on whom our prosperity ultimately depends. If a small business fails, as many do, the entrepreneurs bear all the losses; but if it succeeds, the state takes a large share of the profits. This inevitably discourages new business, especially those engaged in developing new technologies where the risks are highest. This, however, is only half the problem. Most of our taxes are spent on healthcare, education and social security. And these are areas where the costs tend to rise, and where demand increases; indeed, even now we are undoubtedly spending too little. Yet if we to raise taxes even higher to pay for expansion, the damage to our economy would be so great that tax revenues would actually fall. So we are caught in a trap: we need and want better social welfare; but while it is financed through usury – in the form of taxes – we cannot have it. In fact, if we had some other means of meeting our demand for social welfare, we would eliminate unemployment at a stroke. The final and worst form of usury is pollution. Through our emissions of greenhouse gases and other pollutants, we are imposing incalculable risks on future generations. Even those inclined to disbelieve predictions of climate change must agree that rapid rises in temperatures are a possibility – and that the consequences to our descendants could be appalling. Just as usury is the common cause of these profound crises, so we can only resolve them by tackling them together. In the first place we must take the provision of social welfare out of the hands of government, and create social trusts of various kinds to which we contribute directly. Just as historically the extended family acted as the means by which the able-bodied looked after the young, sick and elderly, so we must each be required to subscribe to entities that finance education and healthcare. Such trusts could compete with one another to provide the best service, with the government having inspectors to ensure minimum standards. Taxation should be confined to subsidising the subscriptions of the poor. By this means we would find ourselves choosing to spend far more on social welfare, with far higher standards, and less on material goods. Once people are confident of good social welfare, they will have no need to save without risk through banks. So we can divide the banks into two, eliminating financial usury. There should be deposit banks that purely protect and administer our money, charging a fee for their services. And there should be capital banks providing capital for businesses, mortgages and so on, where we invest our money at risk, receiving income from what the banks earn. Taxpayers would thus no longer have to underwrite the banking system. This in turn would at last embolden us to tackle pollution. It is now three decades since we became aware of the dangers of climate change; yet investment in the development of clean energy technologies has been meagre, and the results pitiful. The reason is such development projects are highly risky, so banks typically refuse to fund them. But if the only means of accumulating wealth were to invest at risk, funds would become plentiful. Governments could then announce that in, say, 15 years’ time greenhouse gas emission would be illegal. This would hugely increase the potential returns on clean energy technology, multiplying the funds invested. Just as a similar policy eliminated CFCs within a few years, this policy alone can accelerate the changes necessary to save our planet. And if a single major country, such as Britain, pioneered it, the result would be an economic boom that would induce other countries to follow. Christians hold in their Bible the key to all humanity enjoying a prosperous, just and secure future. Are they willing to take that key, and invite the rest of the world to help them turn it? NOTE: In the 7th paragraph the author writes: " ... banks take deposits from the public, and then lend that money at interest to individuals and businesses." My research indicates that banks do NOT lend out depositors' funds. Instead, banks create brand new money for every debtor that requests a loan or mortgage. The debtors signs a promissory note and the banker issues the principal BUT the banker never issues the "Interest" or "usury" portion of any loan or mortgage. UsuryFree Day is expected to become even more popular than Earth Day as people learn the 'truth' about the problems associated with usury and the solutions as offered by usuryfree creatives. Did you know that Earth Day has become one of the most popular global celebration to date, with an estimated one billion people participating in the activities in thousands of places all over planet earth. By the way, the first Earth Day was on April 22nd, 1970. The first UsuryFree Day was on November 13th, 2005. When will there be one billion+ usuryfree creatives celebrating UsuryFree Day? Let's make it happen at an even faster pace!! UsuryFree Day is celebrated each year on November 13th. The week from November 13th to 19th is designated as UsuryFree Week. The focus on UsuryFree Day and Week is (a) on the problems attributed to the design flaw of usury as the killer machine that keeps debtors in financial slavery, generation after generation and (b) the optimal solution as offered by the usuryfree community currency movement. Indeed, usuryfree creatives are re-educating themselves and others about the evils of usury on our orthodox, economic system of debt money and about the power and potential of we-the-people learning how to create and spend our own usuryfree community currency. There is now much evidence that our orthodox economy of usury-based, debt money is crumbling before our eyes. During UsuryFree Week (and during the other 51 weeks of each year) usuryfree creatives are inviting people everywhere to re-educate themselves on the 'truth' about money. As we make plans to celebrate the Sixth Annual UsuryFree Day & Week from November 13th to 19th, 2010, we are inviting people everywhere to organize local events during that week. Our kick-off event is scheduled to take place in Kitchener, Ontario, Canada on Saturday, November 13th, 2010. Watch for follow up details of this event and other events during this Sixth Annual UsuryFree Week. 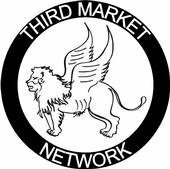 Plan an event for your local community and invite those who are ready and willing to be re-educated about modern money creation. Please forward details of your events to: tom@cyberclass.net with “Sixth Annual UsuryFree Week” in the Subject line. Our standard of living is being lowered. It is part of the plan. A strong nation is not a candidate to surrender its sovereignty, but a weak nation is. If Canada, like the USA can be brought to their knees, if there can be despair and riots in her streets, then perhaps she will willingly accept a UN peacekeeping force, the blue helmets or a devious and secretive plan to rescue the economy with an international monetary unit, that has perceived, purchasing power for a short time. This is how it is being played out. The name of the game is not wealth - it is raw power and global control of the debtors who are forever enslaved financially by their creditors - the usury bankers. So what are we-the-people - the majority of whom are debtors - going to do about this? It is obvious that we have to slay the usury creature. We cannot allow this usury creature to continue. Usury must be abolished forever! Wouldn’t it be nice if we could implement the optimal solution of usuryfree living tomorrow? How are we going to do this? The optimal place to do this is within Parliament here in Canada whereas it should be in Congress in the United States of America. Parliament has the power to abolish usury and create usuryfree money for we-the-people of Canada. We must build a fire under the current politicians or elect new politicians who are truly emplpoyed by we-the-people. It looks like we may have to elect some new faces in Parliament at future elections. In the meantime, we can keep re-educating our current politicians and inviting them to take action NOW! It does not matter from which political party, the titles are not important. It is the principles that our already elected or newly elected politicians believe in that is of utmost importance. Obviously, we need an informed electorate within the Court of Public Review and our employees, the elected politicians must know that we have re-educated ourselves and that we know the “truth” about modern, money creation. The people and the politicians must know the “truth” about economic issues, so re-education is a necessity and it is not happening within the walls of formal education BUT it is happening here in cyberspace. Neither voters, nor politicians will know what we are talking about unless they follow a self-imposed course of study to fully understand how the shortage of money is directly and/or indirectly caused by the usury creature. Now, thirty years later, in 2010, when I talk about the usury ceature, they lean forward and ask: “How much time do we have left?” It is visible all around us now. The global bankers and their New World Order politicians are ushering their New World Order by preparing us for a usury-based, digital world monetary unit, a World Court of Justice, A World Taxing Authority, a World Army, etc. Even as you read this document, the majority of the military from the various countries of the western world are serving under foreign officers with a mandate from the United Nations. Time is running out fast. Whatever, you plan to do for your country, for your freedom, do it now. Just remember that the really good news is that we still can do it. We still have time. We still enjoy some elements of freedom. So, rather than focusing on the negativity and constantly complaining about how bad things are, or how late the hour is, let us rejoice over the fact that we can still meet, we still have elections and we can talk openly and write letters to politicians and the media to expose the usury creature for the evil and immoral animal that it is. Then send an email to Wally (see Wally Dove's email address in the email below). Tell Wally that you got the referral from Tommy UsuryFree Kennedy aka "Tom J. Kennedy" and ask him to forward the series of documents that were attached to his original email that he sent on September 28th, 2010. Then, if you live in Canada, forward your own email to the federal politicians and invite your friends to do likewise. If you live in another country, you are invited to take a leadership role and prepare a similar letter as a template that offers a similar solution as Wally Dove has suggested for Canada and share it with others in cyberspace. Let’s make this idea go viral! I suggest that this be a priority item to be discussed at workshops and seminars and kitchen meetings - anywhere in the world - during the forthcoming Sixth Annual UsuryFree Week scheduled from November 13th to 19th, 2010. Comments, ideas and feedback welcomed. The reason this may be the most important e-mail you ever receive is because it provides you an opportunity to participate in saving your nation and securing a bright and prosperous future for you and your family. The federal Minister of Justice, James Flaherty, has asked the people of this nation to provide suggestions for improving the financial system of Canada [see attachment from the Toronto SUN]. As you may know, the financial (monetary) system is the foundation for the entire economy and if the financial system is not working, or not working for you but instead is working for the bankers, then neither is the economy, and we are all, each and every one of us, affected by the economy. As the economy goes, so goes our health and welfare. Also attached is the mail that we have sent to the Minister to serve as a guide for your input. Also attached is a Word document containing a list of e-mail address fro all MP's in Canada. Just cut and past into your e-mail program. Also attached is a sample e-mail sent to all MPs. Finally, we have attached a Treatise that may assist those of you who do not understand the system, to hopefully, attain a cursory understanding of it. Please remember, the solution that we are providing is based on the observations of the members of the House of Commons Standing Committee on Banking and Commerce of 1939 and, although we have been recommending such a solution for years, we simply quote the Committee in this instance which will prevent anyone from dismissing our suggestions as the ramblings of uneducated troublemakers. Please seriously consider writing to the Minister, with what we consider, the only solution to the present floundering financial system, interest and debt free currency issued by the government and not the present system of interest added, debt currency. Currently the bankers are benefiting from our credit, whereas, we should be benefiting from our credit. Please pass this on to everyone on your e-mail lists and let's try to have at least a million people make the same suggestion to the Minister of Finance and the government will then realize that the people are awake and know what is going on. I personally was unable to open this link and I asked my Internet provider why and after a some attempts to open it themselves, they told me that it looks like the document at that site is censored. I hope you can open it but if not, we hope to be able to send you the Minutes in due course because we have a copy and intend to scan it in PDF format. May the Divine guide you in your deliberations.